The Top 50 Women in Engineering list was published in the Sunday Telegraph on 24 June. The list of the Top 50 Women in Engineering 2018 (WE50) was published on 24 June 2018 in the Sunday Telegraph as part of the celebrations for this year’s International Women in Engineering Day (INWED). 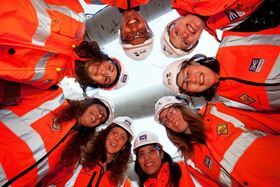 The WE50 list, compiled by the Telegraph in collaboration with the Women’s Engineering Society (WES), featured the UK’s top returners and transferrers into engineering and allied sectors and were chosen from nearly 200 high quality nominations. The candidates on the WE50 list represent the very broad range of routes it is possible to follow into a career in engineering. Sectors in which the winning women are employed include structural and electronic engineering, health, environment and academia. Winners are all at very different stages in their lives, varying from early career engineers to senior leadership. The WE50 winners were awarded their trophies at an International Women in Engineering Day Afternoon Tea event held by Women’s Engineering Society on 26 June. WE50 was one of the key events which took place for International Women in Engineering Day 2018. Hundreds of other INWED18 events have already taken place to celebrate female engineers and raise the profile of engineering to women and girls, with more events still planned in the weeks to come. Events have been registered in the UK and across the world, from Canada and the USA to Spain, Panama, Pakistan, Tanzania, Nepal and Cameroon.